Stephanie Bower and Gabi Campanario gave a book signing and presentation last Saturday at Daniel Smith in celebration of Stephanie’s new book in Gabi’s Urban Sketching Handbook Series: Understanding Perspective: Easy Techniques for Mastering Perspective Drawing on Location. 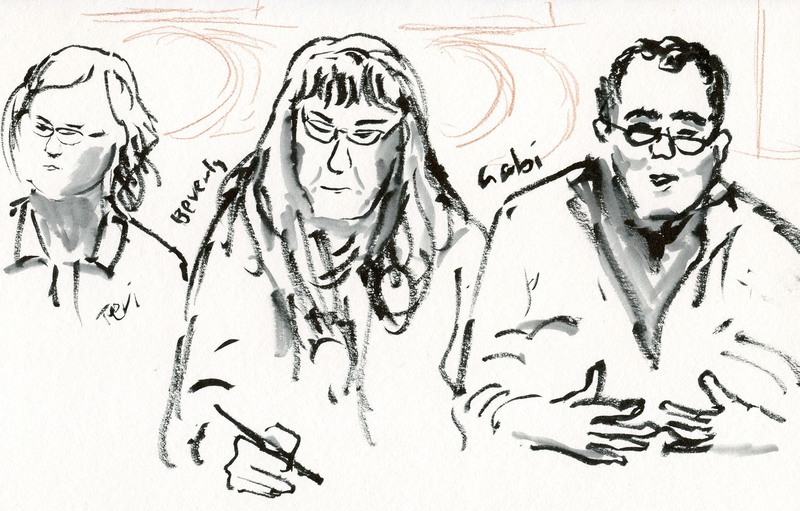 It was fun as well as illuminating to hear them talk about their urban sketching processes. 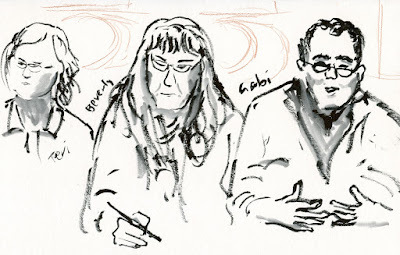 I feel very fortunate and proud to have so many talented urban sketcher authors right here in my own home town! 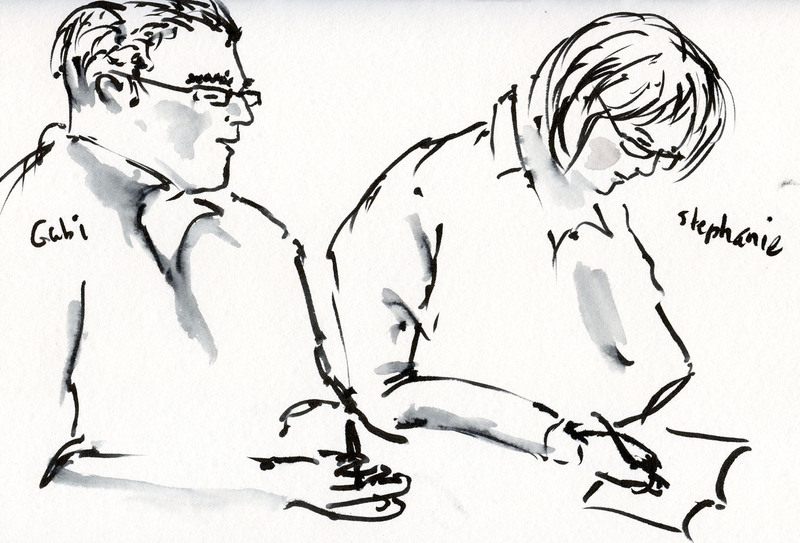 The signing party was followed by a drink & draw at nearby Schooner Exact Brewing Company. 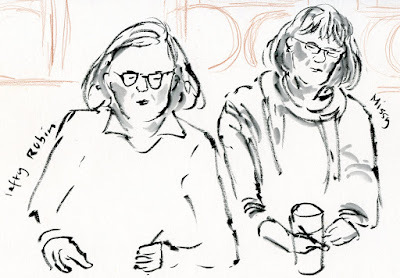 We were seated at two long tables, so I couldn’t sketch everyone around the table, but people switched seats often enough that I had plenty of victims right across from me. Kate was wearing a button that said “Never apologize for your art,” so I won’t say I’m sorry about the unflattering sketches here! 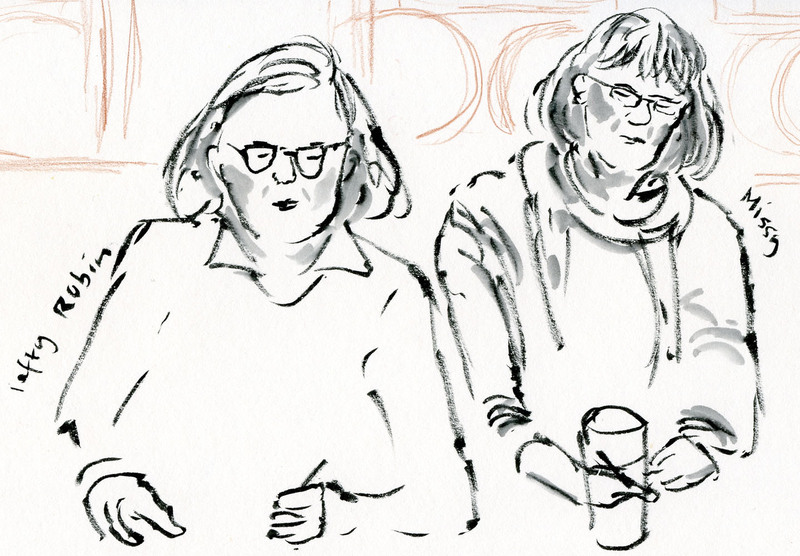 😉 I’ll just say “Turnabout is fair play” – you can get back at me at the next drink & draw! Glad you identified everyone. I'll recognize them next time we meet. The books sound very interesting and informative. I was sad to miss this opportunity, but even with staying local and trying to tone down my freeway time, I've come down with a bad cold. The trick on sketching people is not to name them - that way flattery is not an issue. And as Picasso had a great response when a gallery viewers complained that Mogdigliani's paintings did not "look like women". Madam, he commented, "it's not a woman, it's a painting." Nonetheless yours are quite nice.